Comedian Peter Kay has cancelled all future work projects, including his stand-up tour, "due to unforeseen family circumstances". "This decision has not been taken lightly and I'm sure you'll understand my family must always come first," he wrote on Twitter. Kay said he was "very sorry" and that he hoped the media and public would respect his family's privacy. The 44-year-old was due to start his first tour in eight years next April. 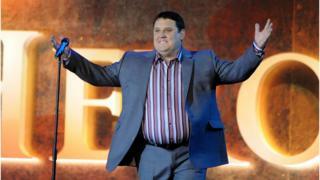 The star of Phoenix Nights and Car Share currently holds the record for the biggest-selling comedy tour of all time after playing to 1.2 million people in 2010 and 2011. His next tour, which had 112 dates listed in the UK and Ireland, was due to have begun in Birmingham and was scheduled to run into 2019. There was a rush for tickets when they went on sale in November. Those who successfully booked seats have been told they will get refunds from their original point of purchase. But the announcement won't affect the final two episodes of his BBC One sitcom Car Share, which he and co-star Sian Gibson announced last month. A BBC spokeswoman said the episodes - an improvised episode and "a special finale" - have already been filmed and will be aired next year. He won't host a number of Dance for Life events that were scheduled for early 2018 in Coventry, Liverpool and Manchester. The events see him become a DJ and turn large arenas into giant dance floors to raise money for cancer charities. Fans have reacted to the news with dismay and concern, but some expressed anger at the sudden cancellation. If you bought from a primary ticket site, they should automatically refund you. These include Ticketmaster, Gigsandtours.com, Eventim, The Ticket Factory and AXS, all of whom have said refunds should appear within 10 working days. Some say this will include the booking fees - others don't specify. If you bought from a secondary site, you have fewer rights. Of the main ones, StubHub says Peter Kay ticket buyers "will receive an email once their refund has been processed"; Viagogo says customers are refunded if an event is cancelled; GetMeIn says fans will be refunded for the cost of their ticket, including fees, for Kay's tour. Seatwave has also promised a 100% refund. Consumer organisation Which? has advice on getting refunds from secondary sites if you hit trouble - including how to make a complaint, claim the cost back from your credit card company or reverse the transaction on your debit or credit card.